Sounds! A constellation of sounds and their correlations in a purely experimental pattern. Dissonances or electronic harmonies? The heart of the debate. 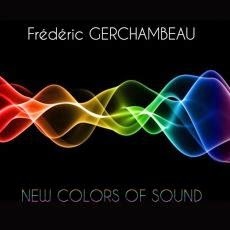 Adventurer of sounds, as much comfortable in harmonic envelopes as in cacophonous spheres, Frédéric Gerchambeau pushes his sound experiments to the limits of the tolerance with an album built on loops and echoes which are used as supports to a sound constellation without rhythms, nor harmonies. The idea behind the concept is more a matter of theory where Frédéric Gerchambeau illustrates, in sounds, methods of composition which are dear to him by exploring sonic territories that he would never have imagined. The result is rather puzzling and will suit mainly to the real fans of synths, their tones and their immense possibilities. I'll say it straight to you; I heard in this nothing very appealing if we are seeking for melodies or rhythms. Except that once we took knowledge of the reasons and motivations around “New Colors of Sound”, we listen to it with another ear. But the result remains the same. The sounds gather in our ears such as a thousand of bees uncertain to want to pollinate and where they are a little lazy, like winds without strength. Although in "Uncertainty Bridge", doubtless the most musical music piece of “New Colors of Sound”, they roar, fume and doze off in the fascinating colors of the multiple reverberations. One would say an exorcist of a synth possessed by the Phantom of the Opera. And it's even more true in the cathedralesque, "Circumreverbambulation" which eats our eardrums with its reverberations which agglutinate and crawl such as a knot of grass-snakes in the mud. The effect of big organ with hoarse sounds remains rather intrusive. Each track is delivered in a spirit of live sessions. There is no re-recordings and Frédéric Gerchambeau shows a surprising cohesion (Uncertainty Bridge) for a completely improvised music. I wouldn't say that Gerchambeau reveals here pallets of sounds in order to build harmonious landscapes. No. I would rather say that he democratizes the ambiences, the art and the possibilities of synths by bringing them to a closer level of understanding of the general public. At this level, the progression of "Watching the River Flow", I like the very cosmic background in it, is rather attractive if we put ourselves in the skin of an astronaut of sounds. For the rest, we cross perfumes of cosmic dissonances in some ambient chirping where Frédéric Gerchambeau remains proud of his uncompromising approaches which demonstrate, and it is the ultimate purpose of this exercise on the color of the sound, the immense possibilities of a modular system. Good listening. And say to yourselves that EM has started from there. Imagine now all the genius which hides beneath the envelopes of skin of those who grind and torture those toys, bringing EM at the level it is today! Please refer to the wonderful site Voices in the Net to take knowledge of the complete set lists offer by EastGate for this event. How to say...! Fans of Tangerine Dream, are we extraterrestrials? Are we living on another planet? The question deserves to be asked because it's with consternation that I noticed that the death of the old silver fox hasn't make any waves. But where do I begin? There is so much to say. True that I always had a critical ear in front of certain albums from TD. This musical ship that Edgar Froese downright puts to dependence in front of these new technologies since the arrival of the digital synths and sequencers in the 80's. But it was the shout of the hunger! The hunger for what Tangerine Dream, for what Edgar Froese and his superb solo albums from this era, has insidiously put in me, in my ears. But I always respected the man. Without Edgar Froese, what would be the face of EM today? Klaus Schulze is not the answer to everything. Without Froese, there is no TD. EM would not has the face it has today. Edgar has completely democratized this art by bringing into it a harmonious and a rhythmic vision. We may not agreed on it, but Edgar has brought this breath of fresh air that this industry needed in order to reborn from its ashes in the 90's. I raged in those years and I had to make my mourning. That been as long as restless, especially since this old man had begun to make me dream again with his damn Sonic Poem Series. And recently his Quantum Years. I knew that Edgar was just sleepy. The thing is, he won't wake up any more! What is left of his inheritance? Hundreds of albums my friends. Music to make you bulimic. DVD! Lots of them. And like a man grieving of love who is looking at videos of his ex, until all tears fled his body, I looked. The old ones like the new. And what I cursed at that time, I love it today. Not always agreed! Oh no! Linda Spa and her saxophone which brings frigging nothing to the music of the Dream. Iris Camaa and her percussions which seem to dictate the speed of her hands and not the opposite. No... Not always agree. But strangely here, it's OK. Recorded within the framework of the famous Dutch event of EM; the E-Day Festival on April 13th, 2008, “Tangerine Dream Plays Edgar Froese-The Epsilon Journey” is the most beautiful legacy, the most current one, where we see an Edgar still in great shape interpreted, with his gang of young wolves, some of his best music. In spite of big absentees from Aqua and Epsilon in Malaysian Pale, the set list remains impressive. Set apart "Hamlet", which is very good by the way, and the last 3 tracks, everything is from Edgar. And there, no doubt, the gang of Froese plays for real. The camera shots seem to have been taken in order of dissipated any doubts on this subject. Is it good? Better! It's a blow of nostalgia where we seize all the dimension of the character. On a solid performance of the band and the very beautiful interpretations, yes yes you read me well, (OK I hated that Linda Spa plays sax on "Lightcone", "Stuntman" and "Metropolis"... It's written there! ), the DVD presents some beautiful video footages of an Edgar dragging its smile and a small keyboard in a desert or on a beach or into a rowboat (what a sneaky little romantic fox he was). It's so many delicious wink of eye in his Stuntman period, as well as those videos of the Three Bikes in the Sky time. We see a serene Edgar with these short footages which are melting quite artistically to the video scenes of the event. An event which is well filmed by the way, with a beautiful lighting and good camera angles which make no doubt on the skills of the quintet. Surprise, and that passes well enough, the images are mainly in black and white or in sepia drawing, giving a rather particular cachet to this concert which uses aptly its numerous computer generated images on a giant white sheet screen. The interpretations are delicious (Bof! I'll skip my thoughts on the sax parts) and the old music of Edgar (what a version of "Metropolis"!) takes a good youthful boost. And we see our dear Edgar smiling constantly, as being proud to transmit his philosophy, his legacy to Thorsten Quaeschning who I'm sure never asked for that much. The whole thing, what! The key points? They are several. "Drunken Mozart in the Desert" is something not to be missed. The same goes for Bernhard Beibl's stunning guitar solos on "One Night in Space" and "Leviathan". The duel of both guitarists is a good moment in "Hamlet", which is much better on the DVD than in audio. At this level, I strongly recommend you the DVD instead of the audio version which seems lacking of depth, of punch. But we are not for a controversy near in the world of the Dream, No?! But no matter. You are looking for a tribute to the great man? Don't expect the unexpected and get yourselves this DVD. The music and Edgar's images will have ever aged so well. And when your ears will cross this infernal melody which roams as a trap to madmen in "Drunken Mozart in the Desert", you will understand everything. 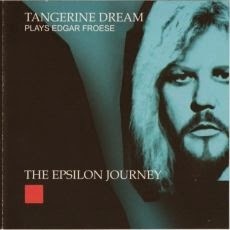 The best memory of him, his music is here on this “Tangerine Dream Plays Edgar Froese-The Epsilon Journey”. It has been a long time that I talk about it; France is becoming little by little the new nerve center of EM, a little as Poland was it in the turning of the 2000's. There are fine artists who emerge constantly. I think of Sequentia Legenda, Pharamond (Sylvain Mazars), Kryfels and now Frank Ayers. There is also the ones of the old guard like Olivier Briand, Alpha Lyra (Christian Piednoir), MoonSatellite and Bertrand Loreau who, from time to time, come by to surprise our ears with works always eager of the new contemporary tendencies wrapped by old analog perfumes. That is without forgetting the experimental side of EM which remains the pride of the French electronic art (one remember of Messe pour le Temps Présent de Maurice Béjard?). And where is situated “Different Skies”? Far from the experimental! In fact Frank Ayers is doing melancholic and outstandingly romantic with a cosmic work where Vangelis, for the melancholy, Jarre, for the cosmic rhythms and ambiences, Klaus Schulze, for the minimalist rhythms in jerks, and finally Tangerine Dream, for the very melodious approach of the Schmoelling years, enchant our ears in what I call a delicious electronic sound feast. From the first astral blows of wind of "Different Skies PART.I", we agree about the New Age control that Frank Ayers has on his vision of electronic harmonies. The tone is warm. I have flashes of Nik Tyndall which light my ears. The movement is celestial with peaceful larvas of synth which interlace and glitter in the echo of arpeggios' ringing of which the reflections of prism are tanning in the sun. We are in the sky of the gods. “Different Skies” is an immersion into unknown heavens. An astral journey inspired by distant and enigmatic soundscapes which are drawn from the imagination of sci-fi books authors such as Arthur C.Clarke and Frank Herbert. The approach is very soft, very musical. A sinuous reverberating line is winding among prismic stars, cosmic spherical bells and dreamlike orchestrations which will remind the first works of Kitaro. A synthesized language perfumes the astral oceans with delicate solos which will awaken Tim Blake's memories. Solos which quite slowly divert the peaceful moods of "Different Skies PART.I" towards a rhythm delicately sequenced with keys which skip and waddle from an ear to another, caressing the harmonious rhythmic patterns of the Halloween genre, from John Carpenter. As you read, there are a lot of references here. And the list will grow. This sequence of minimalist rhythm is running away saves from embraces of mists to dance all alone in the intro of "Different Skies PART.II". The shadows get loose and dance with more delicacy, in order to weave a more harmonic parallel figure. The effect of cascade in sequences is quite attractive, even if it sounds familiar, and the duel rhythm / harmony unveils a delicate intensity with the addition of another line of sequences as well as pulsations of bass sequences. An interesting pattern of ambient rhythm begins then to glisten, as to resound under wandering synth pads and breezes a bit nasal. We are still in the edge of “Different Skies” and everything gets harmonize with delicacy. Then comes the very ambient and cosmic "Different Skies PART.III". The synth pads float lazily in oniric cosmic fogs, reminding me a little of Thierry Fervent's universe. This slow ambio-cosmic movement serves as bridge between the delicate rhythm of "Different Skies PART.II" and the one of "Different Skies PART.IV" which is more lively and deliciously seducing with these lines of sequences which run and stumble in an always rather ambient figure. Voice pads and sweet solos, whistled by very warm breezes, invite us in a feast of the beautiful analog years whereas the rhythm is always offering these upward spirals where the keys are running against the tide, forging these rhythmic paradoxes so unique to the Berlin School. The race stops a little after the 4th minute, diving "Different Skies PART.IV" to a beautiful dreamlike and relaxing passage, before that "Different Skies PART.V" is whipping our ears with a lively and jerky structure of rhythm. The jumping keys agglutinate, skip on the spot with fury and crush their shadows in a kind of staccato cosmic full of traps and pitfalls. The serpentines of sequences and the spasmodic jerks parade in an astral decoration (do you hear these gongs?) which is wrapped by these stellar mists, by these intergalactic dialogues and by cosmic effects where Jarre and Baffo Banfi are meeting (you remember Earthstar?) in a sonic sky sprinkled with delicate solos. Frank Ayers wanted absolutely to revisit the golden age of EM. And he didn't miss his target, that's for sure. We are on cloud nine here. "Different Skies PART.VI" brings us to another level of contemplativity with sonic auroras borealis which are coloring brightly a horizon broken by drum rolls and tears of metallic percussions, but charmingly decorated with shining stars of which the solitary songs get lost in the long night gaps. It's there that "Different Skies PART.VII" makes jump our ears with a lively and shrill rhythm which couples with another line slightly less piercing. Then comes a strange ballet with oscillations shortened of curt movements. One would say a continual movement of allegorical kicks where sequences sparkle and glitter into some uneven figures. Synth pads to the silvered charms add a very TD electronic dimension to this rhythm which makes move more the ideas than the members but which remains charmingly lively. The kicks get out of breath and "Different Skies PART.VII" embraces a brief moment of misty ambiences with winds, rustlings, howlings of dented bodywork as well as a panoply of cybernetic elements and some rather avant-gardist electronic effects which remind all the wealth and the borders of the electronic art. Wealth which bursts even more violently in "Different Skies PART.VIII" and its bouncy structure of rhythm. Ambient, this rhythm quivers with an alignment of bright hoops which collide their stroboscopic shadows under the laconic pulsations of a bass sequence. The sound structure glitters with fragrances of Vangelis and Tangerine Dream with rolling of percussions, Babylonian breaths, serpentines lamentations and synth lines decorated of modernist which adopt the madness of this electronic staccato of which the fine nuances avoid the traps of redundancy. 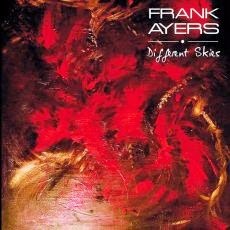 And that ends in banks of mist, strengthening even more Frank Ayers' vision which offers his “Different Skies” a subtle mixture of genres and times. A very beautiful and musical album that you will still listen to in 10 years. 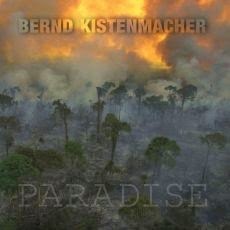 Bernd Kistenmacher had literally riveted my ears to my loudspeakers with the striking Utopia. He managed to implant a rather dramatic cachet in black intrusive universe where the dissonance has found the roads of harmony. Clearly more melodious, a bit less clashing, a little more ambiospherical but always so wrapped by an immense dramatic veil, “Paradise” lies down its fascinating influence on our senses. The paradise in question is literally the one that we wish at the end of our days. Is it a utopia? The link is to make, so much Bernd Kistenmacher pulls us with so much subtlety in the spheres of a fantasy that alone we have the keys of the secret. Singings of birds are waiting for our ears at the opening of "Ghosts". Their chants are melting in a threatening decoration where are muttering breaths of thunder and oozes a rain which becomes more and more plentiful. An attractive sound fauna unveils little by little its charms as time goes by and as "Ghosts" evaporates in its dust. Delicate philharmonic breezes are blowing among the paradisiacal birdsongs, bringing these soft ambiences outside the paths of sadness. Of all this, there will be the vestiges of a forgotten melody which will resuscitate in the tumults of "Born from Innocence". But before, its intro shines like a rivulet of prisms delicately whipped by lazy breezes. An unctuous wave gets gild by the charms of a flute, while slowly some notes of a Hispanic guitar try to lure the percussions which are tumbling more and more heavily. The tumult, the dissonance of Utopia is reborn here. The rhythm of "Born from Innocence" is hammered by titanic percussions which structure a heavy and slow war march. The melody buried in "Ghosts" splashes up here by the breaths of a philharmonic synth. The rhythm is shaking with frantic percussions. Angelic voices perfume the ambiences of a celestial approach while the heavy bass line inflates its trumpetings. We dive into the comfortable Kistenmacher frenzy. Violent thunders of percussions roll like infernal waves of rhythm, propelling whispers and sniggers. Voices, elements of paranoia get graft in a hubbub as much dissonant as this heavy and violent structure of rhythm which will free itself of its madness at around the 9th minute into a more rock structure. And as if it was possible, "Born from Innocence" glorifies itself of a fluid rhythm, surprisingly musical. A kind of heavy but fluid hip-hop which quietly turns around in the electronic markers of its intro. Wonderful and totally exhilarating! Already, I feel that this “Paradise” will fill me of pleasure, as much as Utopia. From a snore of a chainsaw to that of a big bumblebee, the intro of "Devastating Destruction" does nothing to moderate my waits. And as soon as the chords of nostalgic Vangelis go out from dusts of trees coming to fall, the magic remains stuck deep in my eardrums. Sad and oppressive, "Devastating Destruction" is a very meditative piece with a synth to the harmonies weaved straight from the tears rolling on our cheeks. "Raindance" is the other huge jewel of “Paradise”. The bass line is of a kind of groove with chords which pulse and wave on the rollings of the percussions. Percussions which rub a hymn more rock than electronic, whereas keyboard chords get mix up with guitar riffs which fall nonchalantly, pecking at a ambiguous rhythm which magnetizes us of its skin of cosmic rock. This is no more and no less a continuity of "Born from Innocence", but in a less dissonant envelope and in a more poignant crescendo. The heaviness is omnipresent there. And the cinematographic veil is just as much intense with enthralling layers to the aromas of old penetrating organ. The same goes for "Distant Danger" where these layers float on the tick-tocks of an asymmetrical metronome. There are also ashes of Utopia mixed up in these synth layers. The tick-tocks become frantic tam-tams. And "Distant Danger" is melting into a stunning tribal rhythm filled by deep Roach fragrances where the movement, all the same rather violent, floats more that it moves. It's rather transported, livened up by synth pads in the colors of old apocalyptic organ which float as the shadows of vampires on some unchained tam-tams. Majestic! I'm nailed to my armchair. And that doesn't stop! A distant drone emerges from the silence to mold these fascinating black twists which embrace the tormented melody, and drummed on a keyboard, of "Everlasting Magic". Of its minimalist cocoon, the melody wraps itself of nuances of which the dark veils shape the slow impulses which guide its movement through a thick cloud of twinkling prisms. We cannot deny the influences of Vangelis on the works of Bernd Kistenmacher and it's even more striking on this track which uses perfumes of superb orchestrations. And these orchestrations are slow, anfractuous and enveloping in "Belt of Forests". The prisms are always shining here, but they are wrapped by orchestral caresses which are transformed into violent torrents of staccato, imposing a hatched rhythm where violins and cellos bicker between violence and tenderness in a filmic structure where the disorder is astride on paradoxes before losing any swiftness in the jingles of the chords and the bass pulsations which brand our ears by all this dimension of a work that we hoped anymore after the powerful starting gun which was Utopia. Hat to you Bernd! Here is your best album to life. Tribal ambient!? Everything but ambient! Even if at times the rhythms are a little less frantic. This last collaboration Roach/Metcalf, with this time the contribution of the master of disturbing shaman voices in the person of Rob Thomas, is of an incredible sound wealth with an impressive play of percussions, as acoustic as electronic, which cements more than 60 minutes of soundscapes which will challenge the limits of your imagination. The percussions are thundering, hammering, ploughing and tumbling in structures of rhythms, as much as semi-ambient than frenzied, which raise proudly the meaning of a naming such as “Monuments of Ecstasy”. The electronic and tribal effects enrich structures that I would describe more gliding, more floating than as totally ambient. And the nirvana is doubtless the wonderful title-track which shows without any doubts that EM remains very beautiful, even when it's out of its comfort zone. Once again, the universes of Roach and Metcalf are sparkling with magic. Steve Roach, Byron Metcalf and Rob Thomas unite their fates and their passions in order to make us topple over into a universe where the bewitchment takes quite its senses. 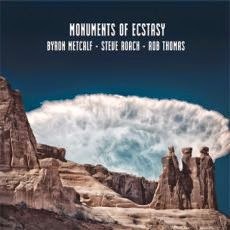 “Monuments of Ecstasy” wears a unique signature which leaves an undeniable imprint of enchantment deep in the bottom of our ears. A long drone perfumes the more or less cosmic introduction of "Archaic Layers". Woosh, wish and wash abound. They whistle by forming some long and sinuous cosmic lassoes, while quite slowly the awakening of the percussions will feed the merciless structure of fervent tribal rhythms that will whip almost the whole of “Monuments of Ecstasy”. Imagine 6 hands which beat wildly various drum skins and you have the color of the rhythms which get breathless the dance spirits of this last effort that offers us the trio Roach, Metcalf and Thomas. The ruminations of the didge and the synth lines of Roach decorate this furious rhythm which eventually calmed down a little after the bar of 7 minutes to dive into a little more meditative atmospheres. These minutes, as well as "This Place on Earth" and the intro/outros will be the only ambient phases of an album which can only seduce, both by the strength of its rhythms and by the meshing of an impressive pattern of clanic percussions. "Monuments of Trance" starts slowly. Transported by the undulatory breaths of the didge, it proposes a tribal/ambient rhythm with heavy percussions which bewitch both the listening and the senses. The effect in a room is totally intrusive. The rhythm remains linear, minimalist. But there are so many jingles, nuances in the strikes of percussions and in the charms of the guttural hummings that we just don't see time passing by, nor the 16 minutes of it. Very impressive! Especially the ferocious spasmodic rhythm of a finale which brings us to another level of spiritual trance. "Primal Analog" skips from an ear to another with a delicious electronic approach. The modular synth weaves superb oscillations which wave along with the breaths of didge and the organic tones, while the percussions, rather sober, and the elytrons of steel forge a delicious ambient rhythm which magnetizes the listening. "Molecules of Momentum" gets out from the soils of "Monuments of Trance". The rhythm is however less dark with a subtle effect of gap which makes it feel a little more furious. The electronic effects are just well measured while the shaman murmurs prick constantly the curiosity of the ears. The approach brushes even an atmosphere of African jungle with tones as much organic than animal. This is a beautiful mixture which is cementing more and more while "Molecules of Momentum" explores a clearly more frantic structure in its second half. This immersion effect in hostile territories is clearly more tangible in the very beautiful "Monuments of Ecstasy". Between electronic and tribal moods, the title-track is a pure moment of delight. The percussions roll an ambient rhythm from where emerges a fascinating organic flora while the synth throws an immense pattern of morphic mist and takes good care to accommodate us of an intrusive melody. A superb electronic, invisible and magical melody! That could last hours, you know the universe Roach, that it would always be magic! Just like this impressive album which is going to join a lineage of little masterpieces so unique to the universe of Steve Roach. Strongly recommendable, even if Roach is not in your taste. To me, it's the best way to adopt him! Don't let yourself being fooled by the very ambiospherical approach of "Part I". Quietly, the synth wizard of Nantes is setting the tone, is setting the basis of “The Tape”. A synth to nasal tones is whistling its airs a bit cheerful which coo in banks of mist of which the nebulosity caresses a cozy rivulet of prismic sequences. Quite slowly, we are getting bewitched. A line of bass makes pulsing some jumping keys while the synth exchanges its charming singings for those of a nightingale in tints of jazz which always shouts and still in a more and more charming sound decoration. A sonic background which reborn out of the vast reverberations from the waves of the bass. And as nothing ever is stigmatized in the ease in Olivier Briand's universe, "Part I" plunges a little into a kind of ambiospherical indiscipline with solos without leaders which skim now a more cosmic approach, as well as some soft and weak breezes of Orion. What always has differentiate the music of Briand is his visceral desire to restore in synths the letters of noblesse that they have lost in all this puddle of harmonious sequences of the New Berlin School mode. Here he fills our ears of delicate electronic flavors with solos to the thousand twists, hypnotizing our attention which perceives well enough these sequences and these percussions which are born and are reborn in a sonic mishmash where are glittering the wave-like prisms of sequences and interlacing solos bearing the soul of forsaken violin tunes. Little by little, the ambient disorder of "Part I" is melting in the structure of "Part II" and of its intro where one believe to encounter an amphibian night-world. The movement of sequences weaves this ambient rhythm which glitters so much like those of Tangerine Dream in the Jive years. We hear the elytrons of metal flickering in the celestial mists as well as the long gurglings of an organic beast. And the sequences begin to dance, to skip. The movement of sequences makes some brief kicks with keys which dance awkwardly on the spot, increasing subtly a pace which catches briskly a heavy pulsating bass line. There is a kind of dramatic mood which bites our eardrums with a threatening mist which always floats in the background. The tension rises. We feel it! The elytrons are clicking more and more and solos become more and more aggressive. And when Mourad Ait Abdelmalek's percussions tumble down; I hear the analogy with Moondawn!!! They roll on a delicious structure of rhythm from the analog years. And they float on the wings of mist as much as they knock down the dissonant harmonies of the numerous synth solos with tones just as much mocking as nasal. Mourad Ait Abdelmalek's play is sublime. Very near Harald Grosskopf with surgical strikes which enrich this electronic / acoustic symbiosis while giving an impression of live which floats throughout “The Tape”. The rhythmic movement of the short "Part III" awakens in me some souvenirs of Richard Pinhas' sequences in his East-West. The synth solos are also shrill but surprisingly very harmonious. The battle between contemporary and vintage rages. We are in a kind of a still virgin territory where the analogue flirts with the digital technology and it's even more convincing with the intro of "Part IV" where the synths remind me of Jarre and his Revolutions. The synth airs and tones, as well as the ambiences and this structure of rhythm in a perpetual restructuring, will remind for some of you those delights of Edgar Froese in his Stuntman and Pinnacles albums. Quietly we go towards the sublime "Part V" and of its famous duel between sequencer and Mourad Ait Abdelmalek. The long intro amplifies each second the explosion to come with electronic percussions and sequences always so gleaming. 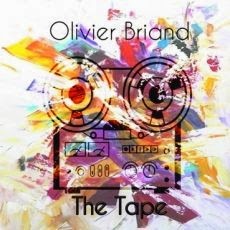 The drum invites itself in the duel at about the 7th minute, giving all the analog latitude to other shiny solos from Olivier Briand. This is as great as "Part II", even a little more violent. But not as on "Part VI" whose bridge is always so deliciously ambio-cosmic kind. It's a great space rock with kicks of free-jazz which scatters its fury in the first minutes of "Part VII" which revisits a little, in a more rock structure, "Part II" and "Part V". Except that I hear, with a great pleasure, this crackling of Richard Pinhas' percussions here. Pinhas, Schulze and Tangerine Dream! All this in a pure electronic envelope. What to ask furthermore? And quietly “The Tape” rushes towards its last minutes. And no way that Olivier Briand will end this in meditative atmospheres! "Part VIII" livens up those last moments with a beautiful battle between sequences and electronic percussions among which the strikes and the kicks fidget under a carpet of contemporary electronic ambiences. The loop is so looped! Why “The Tape” is the best after albums such as Node 2 and Umbra from Arc? Beyond the fact that we have this very perceptible sensation to have the ears riveted to a mini recital, the big strength of “The Tape” lies in this splendid mixture of old and modern. The old analog perfumes of Klaus Schulze and Pinhas mixed in the pure rhythms of Jarre and in the sequences of Tangerine Dream's Jive years. Olivier Briand casts a wide net here. And he makes it with a vision where the spirit of the cosmic rock of the vintage years can marvelously goes alongside to the new madnesses allowed by the infinite possibilities of EM and of its accessories. And admit that Schulze with TD, while passing by Jarre and Pinhas, has enough to charm the most demanding of us here. Those, and there are several, who want and/or think that Tangerine Dream doesn't have completely explore all the veins of its sound experiments; Arcane is the answer to your expectations, to your recriminations. Since Gather Darkness, in 1999, that the music of Arcane follows the shades of that of Tangerine Dream. In fact, the music, the myths and the legends of Tangerine Dream versus those of Arcane are so much near one of the others that we have to investigate the fascinating birth of the English trio who saw, little by little, two of his members leaving the ship in rather misty circumstances, leaving the rudder to none other than Paul Lawler. But let's get back to the music. To “Aphelion”! Contrary to Revenants, “Aphelion” is less heavy, more melodious even with its Near Dark ashes falling here and there. Paul Lawler brings us in the paths of the mysticism here with delicate aromas of Legend which float here and there. And that begins with some soft murmur of synths which float and fall from an ambient sky, such as leaves falling of a sonic tree. The waves of their reverberations awaken a fine line of sequence which shapes a rhythm as much agile as fragile with keys skipping like the delicate clogs of Bambi on a land of fire. Of this indecision, "Aphelion 1" falls in our ears with sounds of flutes and voices of clouded choirs. The movement of the keys increase the pace, widening a delicate rhythmic empire which catches the weight of the mute pulsations while the melody which pierces little by little the core, the center of “Aphelion” awakens in us the memories of Legend, as also of Underwater Sunlight. "Aphelion 1" establishes the pattern of “Aphelion” which will roam all around its 4 structures. 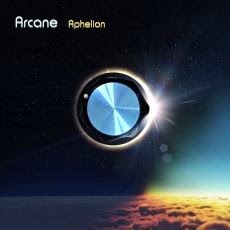 If the approach remains melodiously ambient and delights our ears of fluty harmonies and foggy choruses, "Aphelion 2" offers a structure of rhythm always so mysterious but slightly more livened up where is sparkling a glittering chain of sequences. There is as a scent of mystery which revolves around the music as its structure shells its minutes. Always hesitating, waddling almost like a virgin in front of a carnal buffet, the rhythm rocks and stays hooked on the melody. It develops itself stage by stage, always increasing a strength and a swiftness which will harmonize constantly in these melodies so similar which roam as spectres of Legend. "Aphelion 3" remains just as much delicate, but we observe all the same a swiftness in the tone, so much in the melody as in the rhythm, which announces a probable explosion somewhere. The sequences are more nervous. They divide the rhythm between an approach delicately pulsating and one which is made up of ambient drummings of which the origins become get entangled and tickle in the strikes of good e-percussions. Bit by bit “Aphelion” grasps a kind of electronic rock which is very near of Underwater Sunlight. And it's even more true with "Aphelion 4" and its sequenced keys to tones of harpsichord which little by little sink into a kind of gallop, well detailed by riffs and percussions. The orchestrations give a more film structure while the riffs of guitar cannot ignore the influences that Underwater Sunlight, and even Tyger for the sequences, have over the destinies of this E.P. which would doubtless have explode violently if an Aphelion track 5 would have been. But would it really have been necessary? Because all the charm of “Aphelion” lies in this continual growth which obsesses a listening all the time dumbfounded by this art that possesses Paul Lawler to extract all this water from a source that several people considered once dried up of imagination. The holiday period, these end of year are often synonym of avalanches of CD Boxset, remix and/or compilations for the major labels as well as for the independent artists. The 2014 year was no exception with great gifts from Ultimae Records and DiN label, without forgetting these artists who offered a selection of their best tracks for a price which was, still is, more than affordable in the purpose to make better known their music. “Sequential Mixed Up - The Best of REWO” aims exactly this goal. And the least that we can say is that Rene van der Wooden aimed accurately. Rene van der Wooden is a Dutch artist/synthesist who makes no compromise. His music, strongly inspired by the sequence based Berlin School or the cosmic moods and beats of the French School, is thumbing one's nose at the more melodic rhythms and at the more ethereal ambiopsheres of the Dutch School style. The man likes to exploit long structures, establishing slow ambient intros which little by little are pouring in rhythms which become patiently wilder. At this level "Gruga Platz 4", with its heavy and steady rhythm which gets excited in a long introduction fed by some metallic rustlings which go beyond the 6 minutes point, will rock you off the ground with a sequenced rhythm of an incredible violence which will remind that of Bernd Kistenmacher in Let it Out!. Splendid and wild! I allready scheduled it for my next radio show named Murmure du Son (Radio Centre-Ville Montreal). “Sequential Mixed Up - The Best of REWO” is concentrated on the following albums; Alchemia, 2006, Universal Quiet and Sequential Tourism, both released in 2008, and finally Numerus Fixus, launched in 2009. Each track was remixed, remasterised and even worked again with the additions of sequences and new tones. Only "Gruga Platz 4" is a new track, having being written and performed during a concert held in Gruga Park Essen on June 4th 2011. After this powerful piece which washes ears, "Numerus Fixus Part 6" arrives at us with a version lengthened of almost 4 minutes. The sound is more current and clearly more detailed with pulsations which resound more. And the addition of sequences bring another dimension, as rhythmic but also more melodic than on the original version. "Golden Dreams of Silver Elements" and "Far Across the Heavens" are both tracks which take advantage the most of these benefactions of a new remaster with a new sequencing and cosmic tones. "Golden Dreams of Silver Elements" keeps its approach of static rhythm which swirls into brief spirals made up by jerky loops. Already that the original movement of sequences was very unforeseen, here it radiates of a more accentuated approach with more lines of sequences which wind these uncountable loops. "Far Across the Heavens" is the track which has got the most beautiful sound-lift. Even heavier, the rhythm feeds on the oscillations of an analog Moog. The spirit of Tangerine Dream and of Chris Franke's hyperactive sequences, and their dances a bit free-and-easy, is very present on this heavy and lively track. A little as in "Get Quiet" which is another strong track with some very TD sonic fragrances. Coming from the Universal Quiet album, this track is quite underestimated with furious sequenced oscillations which undulate under the charms of a synth to the perfumes of East. From the same album, "Go Quiet" offers a finely jerky rhythmic which spreads its coat of ions to the intermittent jolts in the sinister envelopes of a morphic synth. Out of the album of the same name, "Sequential Tourism" was my first real crush with the universe Van Der Wooden. This is very Jarre, as much in the sequences of oscillating loops, of which the heaviness ends to get the upper hand over the velocity, than in its attractive cosmic envelope. Even if the differences are less blatant here than on the other tracks of this compilation, the same goes for "Arcadia" of the same album, to re-hear these two tracks of Sequential Tourism shows the Ying and the Yang which cuts clearly Rene van der Wooden's works. 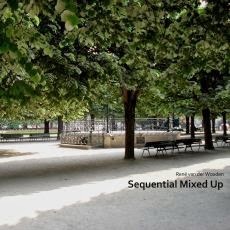 With this nice mix of Jarre and Tangerine Dream, “Sequential Mixed Up - The Best of REWO” is a beautiful, but above all, a fair compilation of Rene van der Wooden's very uneven universe. And when I say uneven, I do not say it in a pejorative sense. Far from there! The author chose aptly a series of tracks, showing the vast gap which marks slightly too often his music. As Van Der Wooden is capable of sculpturing structures that make you totally hooked from the first listening, as he is capable of testing your patience with long introductions which always eventually give birth to a trick that is very pleasant to the ear. "Gruga Platz 4" and "Arcadia" are striking examples of his universe sometimes strongly tinted with paradox. But when it starts, hold your hats with both your hands and feet. 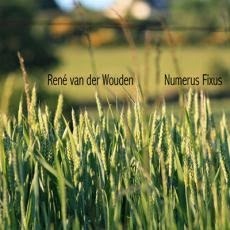 Masterised by Ron Boots, “Numerus Fixus” is Rene van der Wooden's 8th opus. It has as background the fragility of the ecosystems in a world which is going smaller and smaller. I think that it's a beautiful opus with a melancholic aroma. Very much like the Dutch synthesist in a way. Him who is strongly inspired by the analog sound effects, giving so to this album a musical approach more galactic than earthly very much influenced by the French School style of EM. “Numerus Fixus” sails between two universes with a strong scent of Jarre where the cosmos interlaces the perfumes of the Earth with a contemporaneousness which does not really bind to the theme of the album. If the 3 first parts form a moving symbiosis where the paradox earth / space is vibrating, the 5 last ones are projecting us in a sound universe where Van Der Wooden follows the paths there where Jarre has once stopped his creative meter. "Fixus Part I" opens “Numerus Fixus” with fine arpeggios which tinkle, such of the hits on a xylophone, in order to dance lazily on a movement of sequenced rhythm of which the minimalism shape adopts a spiral swirling at the infinite. It's turning into a galactic twisting accompanied by space choirs to the vaporous breaths which scrolls such as a bed song worthy of a Halloween theme where the humming of some motorcycle engines are bursting and get lost in this crystal space. It's an intro full of paradoxes and quite eclectic to which is added the weight of a good bass line which rocks the movement of a same minimalism similarity and where the synth solos breathe of an approach more spectral than cosmic. But the fact remains that "Fixus Part I" is closer to cosmos than Earth with its Mellotron and its slow breaths of violins which cross a sequencing pattern fed of twisted momentums and harpooned by strikes of e-percussions and beautifully painted of colorful sound effects which bring the track towards another level of intensity without however derived "Fixus Part I" of its beautiful ethereal bed song. Electronic tones in the fragrances of the analog years water very often the works of Rene van der Wooden and “Numerus Fixus” is full of it. "Fixus Part II" soaks in these tones with a shower of sound constellations which breaks out under powerful cosmic waves before that a heavy oscillating sequence, and sometimes resonant, livens up a tempo which beats through a panoply of sound particles. Slowly the rhythm gets loose from its lunar approach to kiss a more earthly structure beneath the breaths of a Mellotron which always hesitates between both universes. A Mellotron which harmonizes its fluty airs while that "Fixus Part II" is flirting with the tinkling arpeggios of the introductory part. Always in the register of the crystalline arpeggios to the soft musical prayers, "Fixus Part III" is simply wonderful. It's an oniric sweetness which sings life and hope, like the tick-tack of a timeless watch, in order to finally adopt a sometimes hot and sometimes poetic musicality which in the end is a real pity that it has to be end. "Fixus Part IV" brings us back to the rhythmic soils of Space Art with its fierce beat adorned with some juicy synth interlaced solos, whereas "Fixus Part V" is of a galactic weightiness extremely well structured. It's a kind of mix between Jarre's Magnetic Fields and the post electronic punk of Daft Punk with a heavy and livened up tempo from which a nasal synth offers some beautiful symphonic impetus. Just like "Fixus Part VI" which moreover has a splendid ambiospherical intro and a clearly more roaring rhythmic pattern. This is the wildest and my best track here. "Fixus Part VII" is similar to Jarre's Oxygene period. This track has a very beautiful ambient and cosmic structure which is endowed with a dramatic approach of a rare intensity. "Fixus Part VIII" ends “Numerus Fixus” with a livelier way. It's a heavy piece of music encircled by juicy and fat sequences which run and roll beneath the ethereal caresses of a beautiful Mellotron whose fluty breezes float and wrap some bright tones of xylophones which dance in the shadows of festive percussions. If not in my Top 10 list of 2009, “Numerus Fixus” is then not really far from it. It's a nice album which aims to be a continuity of the analog space music of Jean Michel Jarre without getting into some kind of ordinary plagiarism. There are great passages on this opus that we listen to without having one second of boredom. So, it's another very nice album from Rene van der Wooden who doesn't stop to amaze and also touch. But at the end of the day and once we get familiar with his music, we observe that Rene van der Wooden is to Jarre what Redshift, Arc or Free System Projekt are to Tangerine Dream; the reflection of eras sealed in the time with a fair dosage of creativity and originality. Fans of Jarre and Vangelis; “Numerus Fixus”, and most of Van Der Wooden's albums besides, are true sure values.